A mild 100% vegetable based soap to gently cleanse your skin. This beautiful fragranced soap is designed to make bathing a luxurious and sensual experience. 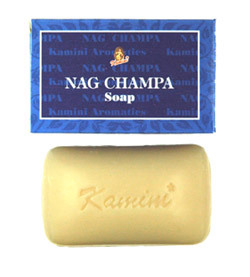 Kamini Nag Champa Soap - 100gr. It's a great smelling soap that is not too strong. Only complaint is that is doesn't last too long.